Text: Living as kids in rural Wiltshire, we never had a chance to go to a cinema there. But every summer we were packed off to our grandparents in Falkirk, and they sent us to the ABC every Saturday morning. In my memory of what I saw in those years cinema and telly are all mixed up, but I remember the atmosphere of the cinema clearly enough. There seemed to be hundreds and hundreds in the Falkirk ABC, and a lot of excitement and enthusiasm, but I don’t think things were being thrown around. It was lively, but not rowdy. At home in Wiltshire we watched telly on Saturday mornings – Tiswas or Swap Shop – and doing that I felt essentially alone. In Falkirk I was part of a crowd. I’d get dressed for the ABC, but not for the telly. The queuing and the anticipation were much more exciting than just walking across the room to turn on the telly. We bought lollipops or liquorice or toffees at the cinema, or we might have taken our own tablet (a very sweet kind of fudge, peculiar to Scotland). For us, the cinema was full of strangeness, specialness and fun. Comments: All Pals Together is a history of children’s cinema in the UK. It contains many evocative memoir passages such as this, mostly conducted for the book, though they are uncredited (there is a list of the names of the interviewees given at the front of the book). The unnamed interviewee here was a member of the ABC Minors club, to which many cinemagoing children belonged. Tiswas (ITV, 1974-1982) and Multi-Coloured Swap Shop (BBC, 1976-1982) were two highly popular children’s television programmes shown on Saturday mornings. They are generally seen as having played a major part in bringing about the long tradition of children’s cinema in the UK to an end. This entry was posted in 1970s, Film books, United Kingdom and tagged Children, Children's television, Cinemas, Falkirk, Food and drink, Matinees, Multi-Coloured Swap Shop (1976), Queues, Television, Tiswas (1974). Bookmark the permalink. one thing about working at the Plaza and not something I particularly liked doing because it was a lot of trouble for me, was policing the children’s Saturday afternoon matinee shows. 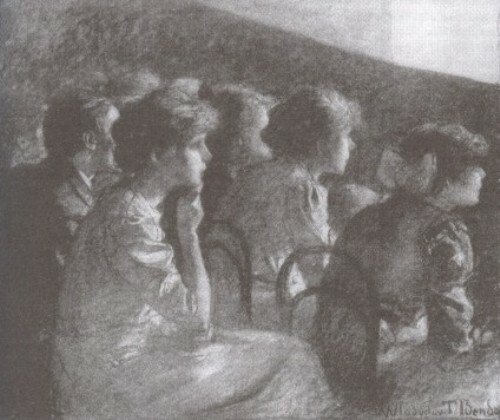 Around three hundred children used to attend every week and the auditorium was bedlam. It was my job to try and keep order in the auditorium between when they were let in at 1:30 and when the programme started at 2pm, after which they would quieten down. The manager, Benny Norcott, used to be in the ice cream place keeping a queue of 5 to 13 years old kids happy with Lyons Maid Fabs or Eldorado Lunar Lollies. Meanwhile, I was trying to keep order the best I could and trying to settle any bullying. “Mister, he’s hitting me!”, complained one sobbing six year old boy, as I picked him up, gave him a cuddle and dried his eyes for him. Can you imagine me being allowed to do that these days? Modern parents would be horrified and I’d have to have a CRB check before I could go anywhere near a cinema full of youngsters. “Oh, he is, is he?”, I exclaimed. “Well, we’ll soon sort him out.” As I was a lot older than the miscreant. who was only ten or eleven, that was easy. After that, the six year old stuck to me like glue and held my hand as I wandered around dispensing instant verbal justice. When starting time approached, Benny would close up the ice cream place and tell me “You can go up and start now.” “Thank God for that”, I would say, as I retreated upstairs to the safety of the projection room, dimmed the house lights and kicked off with the Children’s Film Foundation feature. As soon the British Board of Film Censors certificate appeared on the curtains as they were opening, a huge roar of delight would come up from the auditorium. The kids loved the CFF films, both features and serials, because the heroes in them were kids like themselves and the grown-up baddies were all stupid and incompetent and no match for your average ten year old from Walton-on-Thames or Surbiton, or wherever the film was shot. Ahhh, those were the days. Days that will never return. After many decades of entertaining the local children, the children’s Saturday matinees were discontinued at the Plaza in 1974.